Tuesday afternoon I had another opportunity to get out for a bit. After a full morning of meetings, checking in on another part of my team to see if they needed anything and tending to some email I was ready for a break before my evening activities. Again, feeling the need to walk I set out toward Quincy Market and the North End. The interesting thing about Boston, is that in certain areas for no particular reason the streets are curvy. I guess it probably has to do with history and the necessity to wind around historic buildings instead of create straight thoroughfares through them. The result though, is that while walking I always need to have a map handy and even with that seem to end up taking a more scenic route than first planned! In this case it was fine, but there are times that has driven me crazy. Once passing by the market area, I took a little diversion down to the wharf area for a little water viewing. It amazes me how much this area has been changing over the few years I’ve been visiting this city. From there I turned up into the narrow streets of the North End, home to the city’s Italian population. It was mid-afternoon and, in general, the streets were quiet, with one exception. Those who could were gathered in bars, restaurants, pastry and coffee shops – anywhere with a TV, watching The World Cup games. So I passed several places with cheering folks spilling out onto the sidewalk as I walked around the area. 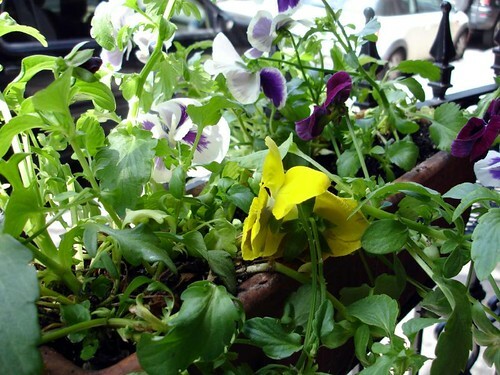 I finally settled on the Florentine Café as my choice for lunch, primarily due to the open windows, cheery flower boxes of pansies and the tables near the windows. It seemed like the perfect place to enjoy a little lunch and the late spring afternoon. 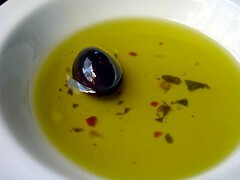 While looking over the menu a basket of bread with perfectly seasoned olive oil was placed on my table. Olive-y and a bit spicy, this is one of my favorite comfort foods. 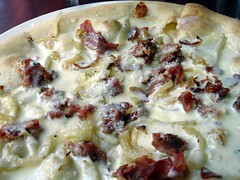 I decided to order a Mista salad and one of their pizzettes, the Bianco. While waiting for my order I watched the world pass by outside my window and just enjoyed the relaxed and social atmosphere of the place. The soccer games were playing here, too, but the sound was turned off, so you could let it be as much or as little of a distraction as you wished. My freshly prepared salad arrived and looked delicious. Crisp greens and slices of tomato, topped with a generous portion of fresh, thin Parmesan slices. 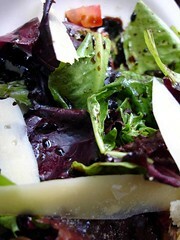 The dressing was simply a little oil and a generous amount of balsamic vinegar. Heaven! The salad was so large that I questioned my need for the pizzette but my order had been placed so there was nothing to do but wait for it to arrive. I have no idea why they call their pizzas "pizzette", as there is nothing small about them! It was probably a good 13" in diameter and was overflowing the plate it was served on. But boy did it look great! Between my large salad and the richness of the dish I could barely eat a piece and a half of the pizzette. I had the rest boxed up, thinking I’d have it as a quick breakfast prior to my next day, early morning flight. It turned out that it didn’t last that long – my evening dinner meeting and party were a bust, food-wise, so when I returned to my room later that night I was able to happily munch on Pizzette Bianco and go to bed happy!